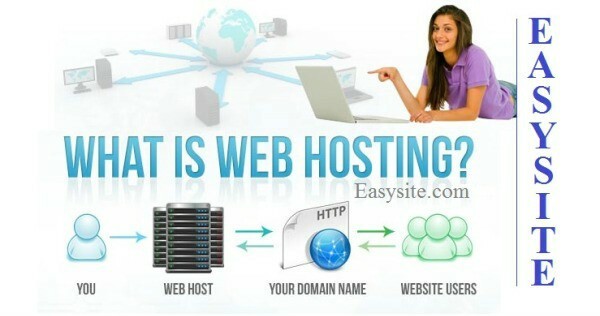 What is Web Site Hosting? There are many misconceptions about what web site hosting is. Because we offer free telephone support to help people make a website, we often get asked what is web site hosting. The customers asking the question realize that it's an important part of the service and that you can't really have a site without website hosting. But beyond that, they're really not sure exactly what it is. This article will help you understand exactly what web site hosting is. More importantly, this article will help you determine the quality of your current web hosting and if it's the best web hosting for you. Did you know you get a free domain for life when you sign up to our hosting? Website hosting is a service that allows people to make a website able to be accessed by anyone in the world by way of the Internet. Basically, you can have a website that you have created siting on your laptop or desktop computer. You can view this site and make changes to it, but until you "host" the site, no one else in the world can access it via the World Wide Web or Internet. You can also think of web site hosting in terms of publishing a book. You might have written a great book. Maybe it's the next great novel that's going to be a number one seller. Unless you publish the book and put it out there for the world to read, no one will ever know about it. The same is true for website hosting – you design a website and then host it so people everywhere can access it. How Are Web Sites Hosted? Sites are "hosted" or "published" or "made live" by placing them on a specialized computer call a server. Server computers are just like normal laptop or desktop computers that you might have at your home or place of business. The difference is that these computers are designed specifically to be running all the time and to not break down. Another difference between a server computer and a regular computer is the software that is running on a server. The software that is installed and running on these systems is designed specifically for web server and hosting purposes. The name really says it best. They are called a "server" because that's all they do – serve up web pages. They aren't used to do word processing, accounting, photo editing or even surf the web. These specialized systems are designed with one purpose – to be the best website hosting computers. Server computers that perform website hosting are housed in what is known as a "datacenter." A datacenter is simply a building with lots of space to have servers located in. The best website hosting starts with a high-quality datacenter. A good datacenter will have multiple connections directly to Internet carriers as well as redundant power with backup generators and/or battery backups. The point of the redundancy with Internet connections as well as power is to ensure that web hosting is always happening. Down time is just not acceptable. This might be easier to understand if you think of an example of what would not be the best web hosting environment – your house. The place you live most likely has one Internet connection and one source of power. If you setup a web server and decided to hook it up to your connection at home what happens when the power goes out? That's right, the free website hosting that you've created goes down which results in people not being able to visit or see your site. The same is true if your Internet connection goes out – goodbye hosting. Another problem with trying to create free hosting of web site, is that you're Internet service provider can change your IP address at any time. The IP address is the unique identifier for your Internet connection. When this happens, your homemade affordable hosting service goes down. What's The Best Website Hosting? The best site hosting is obviously not going to come from a company offering free domain name free web hosting. Like anything else, if you want the best, you have to be willing to pay for it. The best hosting is going to come from a company with strong servers that are located at a high-quality datacenter. If you have both of those things in place, you will be able to design a website that will load quickly and be able to have many visitors to the site at the same time. Be aware that there are lots of Internet companies that will offer free hosting of a web site or free business web site hosting. These companies offer free domain name free web hosting only to sell upgrades to the service or add-on site development tools. They're in business to make money; they're just not being forthright in how they are doing so. Many of these companies load up a single server with hundreds or even thousands of sites. Because these sites are sharing the resources of one computer, the performance will suffer dramatically. We have personally seen small business owners spend thousands of dollars to create a website only to then use free business web site hosting. This results in a site that loads very slowly. When this happens, visitors to your site will not stay long to visit. Worse yet, search engines give poorly performing sites lower ranking on search engine result pages. This is a serious problem for business owners. Search engine ranking is like gold for small business owners who need exposure to potential customers. By choosing to use free business web site hosting, these companies have effectively guaranteeing themselves low ranking on search engine as well as frustrated site visitors. The bottom line is if you create your own site; plan some budget to get the best hosting from a reputable company that specializes in website hosting and domain registration. Good hosting is going to come from good companies that are housed in a high-quality datacenter and charge a fair fee for the use of their services. We encourage people to visit the datacenter that they are going to use to. See for yourself what the quality of the building is, how cold the rooms are that house the servers, if there is redundant power and data connections. Ask questions and get the answers. Also ask for references to other small businesses that use their facility. Once you have selected an affordable hosting service that is high-quality, you're going to have to test your site for yourself to ensure that you're getting what you paying for. There are plenty of online tools to help you do the speed and load testing for your site. SEOSiteCheckup.com is a good site with lots of tools. SEOTestTool.com is another one. Take notice the term "SEO" that's being used in these URLs. SEO is an abbreviation for Search Engine Optimization, which means how well your site is setup to rank on the search engines. Because the load time of your website has a profound effect on how well your site will appear on search engine results pages, these search engine websites will help you test the speed of which your site loads. Ecommerce website hosting is specialized hosting that is used for site that sell products and services online. Ecommerce web hosting should be considered as a step above conventional web hosting because of how important its job is. When you're selling items through your web site, you need to make sure the site is always up and that it's able to handle sensitive financial information as well as processing of transactions with a merchant account. This type of ecommerce web hosting may also include the added requirement of installing a secure certificate. The secure certificate is a unique key that is specifically created for you to be used when you build your own online store. You will learn more about this when you learn how to create a store website. Basically, financial information is encrypted (think secret code) before it's transferred across the Internet to the server that is responsible for your ecommerce web hosting. Once the server receives the encrypted information, the certificate is used to decrypt or decode the information. This creates a safe way to collect the sensitive information you use to process transactions after you build your online shop. The easiest way to learn how to create a store website is to use an ecommerce website builder and hosting company. Companies that offer an ecommerce website builder and hosting will give you all the easy-to-use tools, tutorials and tech support that you need to get started. Many people who develop sites (web developers) may not understand what is website hosting, because services have become invisible to them. These are what we consider to be managed services. Someone else manages the services, so the end user never really sees the hardware or network infrastructure that supports them. A new term for this type of service is "the cloud". Everyone is talking about the cloud, it's up there in the sky somewhere, but no one really sees "the cloud". They just know it out there somewhere. Believe us, the cloud is simply a datacenter or many datacenters with lots of servers running services for that are hosted on the Internet. Amazon is a good example of this. They have their own cloud service that many large sites depend on to be their web server and hosting. In fact when there are problems with the website hosting provided by managed services the effects are most visible when it affects social networking site, such as Twitter. Other services that offer website hosting and domain registration can also be affected when there are problems with the clouds. Easysite.com is our website builder service. Easysite makes it easy for anyone to create a website within minutes. We consider Easysite to be a premiere do-it-yourself site builder. It makes it quick, affordable and easy to make a site. You can even create an ecommerce web site in a matter of minutes. Included with the service is free domain name with web hosting. The free domain name with web hosting is a new part of the recently launched Professional level service. Unlike other companies that hold you hostage, the free domain name that you select is really your domain name that you have control of and own. You are even free to transfer the free domain name that you select to a different service should you decide to discontinue your Easysite service. Sign up today for a free, no obligation trial to try the site builder for yourself by visiting easysite.com. If you have any questions about what is website hosting after reading this article, please call us at 877 832-7974. We would be happy to discuss your site hosting questions with you.